Above Ground Water Storage Tanks | Modutank Inc. In a growing number of applications, custom above ground water storage tanks or modular storage systems are increasingly utilized as alternatives to conventional round tanks. Among the advantages claimed for modular systems are lower per-gallon storage costs, ready availability from inventory, and rapid shipment and installation for permanent or emergency storage and remediation. By design, modular containment systems (i.e. above ground impoundments) are easily configured for irregular sites, quickly bolted together for use, and can be later dismantled for relocation or storage. The systems are equipped with chemical resistant flexible membrane liners for handling and treatment of virtually all liquids, hazardous wastes and sludges. All structural components are corrosion resistant. Modularity is not unique in terms of the technologies inherent in many of today’s typical round tanks, those assembled from prefabricated curved panels which are sequentially bolted or welded together. However, a new view of modularity proposes a change in how we classify the design, assembly and application of such containment systems. When we think of tanks, we are inclined to think only of round above ground water storage tanks, which may or may not possess some degree of modular construction. Modularity becomes a total design concept with the advent of low-profile rectilinear systems which can be customized into virtually any right angle shape and can accommodate millions of gallons. An authentic modular facility for heavy-duty use can be purchased off the shelf. It is a packaged prefabricated system with a designated number of steel panels and framing members of specified sizes and types, accompanied by an appropriate flexible membrane liner of proper fit; all galvanized components are standardized. 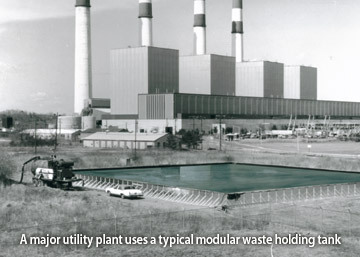 Modular containment ranging from 300,000 to 500,000 gallons is typically less costly than fabricating and installing liners in ponds or berms of equivalent capacity. Modular rectangular tanks are also reported to be economical short-term answers for liquid and solid transfer and storage during pond repairs or closures. Similarly, above ground modular systems could become practical alternatives to excavating ponds in rocky or frozen soils, or in areas with high water tables. A principle issue in evaluating the different systems is the round tank’s practical storage limit, as affected by hoop stress. The larger its diameter and height, the greater the rupture strength required of the round tank’s structure to safely contain its contents. Modular rectangular tanks are correspondingly modest in height, ranging to about six feet. Since wall pressure relates to the height of the liquid contained, the structural members of low-profile tanks can be fabricated of lighter gauge, less costly steel. Fewer bolts are required, and special, massive foundations often built to support round tanks of similar capacity could be eliminated. However, modular systems have their limitations. Lower in height, rectangular tanks obviously have larger footprints than do higher round tanks of comparable volumes. If space is at a premium, round above ground water storage tanks may be the only viable choice. Furthermore, depending on the storage application, a round tank might be more suitable for extended long-term permanent containment. Accordingly, the cost-efficiency of the modular rectangular tank could recommend it for shorter term high-volume service involving millions of gallons of liquids or sludges. Modular design could help answer a common question of site planning: How can tankage most efficiently utilize an irregularly shaped area? 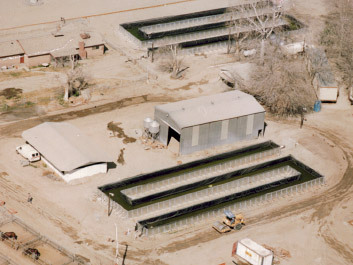 Depending on space restrictions, a conventional solution might nest a number of small round tanks within the area, possibly interconnecting them with pumps and piping. Complexity often poses costly engineering, operational and maintenance challenges. On the other hand, a single rectangular modular system could be configured for bolt-together assembly conforming to the contours of an odd-sized site. The tank’s right-angled sections or “legs” could be extended in any direction congruent with the area’s boundaries or intruding structures. For example, patterned as the letter L, a tank could be cornered around obstructions. In the same manner, the standard building blocks which compose the modular tank could be organized into T, X or U shapes, or into asymmetrical configurations corresponding with available space. A single membrane liner would serve the entire facility. Modularity also applies to the selection of chemical resistant flexible membrane liners for these tanks. The purchaser has numerous application-specific materials in various thicknesses from which to choose. Included are premium quality low- and high-density polyethylene, XR-5?, Hypalon?, polyvinyl chloride and polypropylene. Industrial-quality liners are designated by their physical and chemical resistance properties. As a result, the selection is generally simple and logical, a function of the tank’s proposed application. The appropriate liner is usually prefabricated at the shop to the tank’s dimensions. A critical variable is the height of the tank; an unreinforced liner supplied as a flat sheet would normally serve a low-height rectangular system of simple configuration. However, reinforced liners are recommended for modular round tanks above fifteen feet. The cost differential between unreinforced and reinforced liners is another factor in the competitive equation. Modular tanks accept a variety of leak detection systems designed for environmental protection. Floating covers and baffles, as well as piping and plumbing arrangements can also be specified. Tank installation may be completed on leveled, compacted ground, or on concrete or asphalt surfaces. Engineered with a modest degree of flexibility, they will adjust to minor site variations and imperfections. Little supervision is usually needed over assembly crews employing ordinary hand tools. Modular systems knock-down for standby emergency containment or relocation from site to site. In addition, they can be reconfigured in the field by adding or deleting modular panels and installing a suitably-sized replacement liner. In the near future, modular rectilinear tanks and above ground impoundments will predictably emerge in full partnership with conventional containment systems as the concept further develops and gains wider recognition and application. Reed Margulis is president of ModuTank Inc., Long Island City, NY, 718-392-1112.